Only 150 will be made... if its upstart manufacturer can sell that many. Hybrid hypercars have emerged as the new gold standard in exotic performance. So far we've only seen one come out of Italy, but soon the (now discontinued) Ferrari LaFerrari will have company – and it'll be even more powerful. The Puritalia Berlinetta is set to debut at the 2019 Geneva Motor Show next month with a "SuperHybrid” powertrain kicking out 965 horsepower and 920 lb-ft of torque. 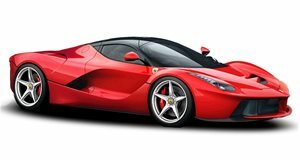 That'd be enough to outmuscle even LaFerrari's 950 hp and 664 lb-ft, and will be far more exclusive – assuming it actually goes into production. If the name of the manufacturer doesn't ring any bells, allow us to refresh your memory. Puritalia first came to our attention seven years ago when it revealed the 427 (pictured at bottom) – a roadster inspired by the Shelby Cobra, reinterpreted with Italian styling. We don't know how many of those it might have actually made, but now the company's back with an even more ambitious project. Its Berlinetta is designed to combine a V8 (of unspecified origin and displacement) mounted up front, with an "axial flux” electric motor at the back, to deliver those headline-grabbing output figures. The two-door GT is set to be cloaked entirely in carbon fiber, crafted to order in revival of the "Golden Years of Italian automobile design.” It's designed around a carbon monocoque with aluminum sub-frames to offer perfectly balanced 50/50 front-rear weight distribution, and is also said to feature CNC-machined aluminum suspension components, a quad-pipe titanium exhaust, and cloud-based, artificial-intelligence engine management. No more than 150 examples will be built to customer specifications, but that's assuming the upstart manufacturer can find that many buyers willing to fork over what's sure to be a rather hefty sum to a relatively unknown entity.